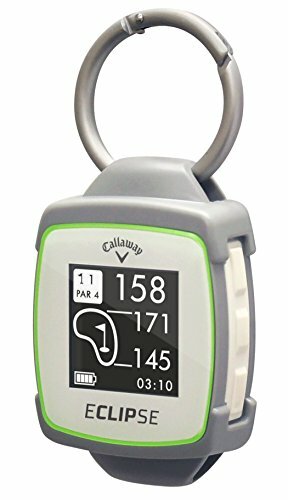 The new and improved Callaway ECLIPSE Golf GPS offers superior performance in a unique design that delivers unmatched wearable versatility and convenience. Just hang it off your belt or golf bag, or simply detach the invert able/removable clip and carry it in your pocket. Don't let its diminutive size fool you, the ECLIPSE GPS packs a powerful punch with 30,000+ preloaded global courses and accurate Front/Center/Back distances to greens, as well as both Layup and Carry distances to hazards and doglegs. Keep score and store round data right on the unit while tracking key stats such as GIR and Total Putts. Includes auto course-recognition, auto-hole advance and a shot distance measurement feature. The rechargeable lithium-ion battery lasts up to 10 hours. Available in 2 colors: Black and White. Comes with a 1 year limited warranty.